This article is from ATAVUS - the e-magazine for subscribers of Burke's Peerage & Gentry. For more articles visit www.burkes-atavus.com. 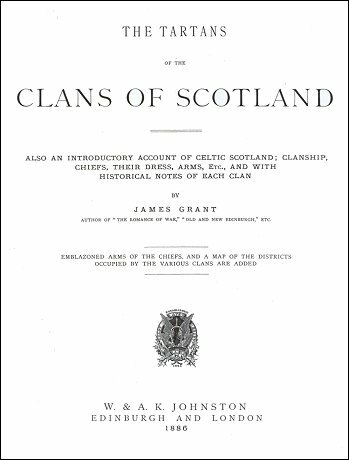 Chapter two of an extract from the publication 'The Tartans of the Clans of Scotland', By James Grant. The publication is held at the Odom Library in Moultrie, Georgia. "Highland clan," says Duncan Forbes of Culloden, "is a set of men all bearing the same surname, and believing themselves to be related, the one to the other, and to be descended from the same stock. In each clan are several subaltern tribes, who own their dependence on their own immediate chief, but all agree in owning allegiance to the supreme chief of the clan or kindred, and look upon it to be their duty to support him in all adventures." The patriarchal system of clanship thus made the people regard, with unfailing devotion, their chief as the head of their race, and the representative of their common ancestor; While the iron feudal system, which was unknown among them in the earlier ages of Highland history, compelled the people to obey their leader as feudal lord of the lands on which they dwelt. The introduction of the feudal system was a work of slow progress indeed, beyond the Highland border; for, between it and the patriarchal there was a vital distinction. Under the latter, the land was the common property of the tribe; under the feudal, it was made the personal property of the chief; hence the bloody strife that ensued in 1544, when John of Moidart, the Wallace of the Celtic tribes, came forth in arms against Argyle on the west, Huntly, Lovat and Mar on the east, in the strife that ended in the battle of Blairleine. It is now generally supposed that there were no clans in the Highlands, till the great Celtic Earls became extinct, early in the 13th century. Before the Earls appeared in history, the various people in different districts were ruled by Maormars; "but Tacitus," says Mr Robertson, "is a clear authority, that in the first century the inhabitants of Caledonia had nobles or leaders among them, who ruled the tribes, and selected the Ardrigh or supreme king, as he states that the choice of Galgacus as sovereign was from among many leaders." Early in the 14th century clanship seemed to have become pretty well defined over all the Highlands, and by 1587 a distinct and formidable roll of the clans is given in the Acts of the Scottish Parliament under that date; and, despite the oppressive act of the British Parliament in 1747 clanship existed in Scotland till the middle of the 18th century, in as much strength and purity as it ever did in ancient times. Divided among the more fertile glens, separated from each other, and surrounded by lofty, and in many instances almost impassable mountains, the various tribes were separated by permanent and well-known boundaries. To the denizens or each glen, all within the visible horizon was "a country," as Lord Reay's country, the country of the Gordons, etc. Common interest required the people to have local clan or district governments; their laws were traditional and known to all, while ancestral honours and blood, like the soil they dwelt on, were regarded as the common inheritance of all. The people of these, then almost inaccessible, regions owned little more than a nominal subjection to the King of Scotland, allegiance to him being always subordinate to that which they yielded to their hereditary chiefs, who ruled them with absolute, but not irresponsible, sway. These clans were always at war among themselves, often viewing the Lowlanders as the common foes of all. An affront or an injury to the most humble individual, from one of another clan was held as an insult to the whole, and too often one never to be forgotten or forgiven. Blood alone could atone for it, and, if not avenged by one generation, the feud was bequeathed as a precious legacy to the next; and there have been occasions, as we shall show, when the extermination of an entire community was not deemed a sacrifice too great for vengeance. Thus, in such a state of society, when men never went unarmed, either to field, church, or market, human life was held exceedingly cheap. Besides fighting and plundering each other, not unfrequently several clans united, especially on the Borders, and bursting into the more fertile Lowlands, swept off herds, flocks, and the produce of the harvests, into their mountain fastnesses. To his chief, the clansman bore all the blind devotion of a child to his parent; his obedience sprang from the same law of nature. The clansman, who scrupled to save his chief's life at the expense of his own, was regarded as a coward who abandoned his parent in the hour of peril. His duty was indelible and no feudal grant or human engagement, marriage or death, could be preferred to the service of his chief. Limited to its own glen, each clan increased in numbers far beyond the means of subsistence there; but each little mountain farm was divided and subdivided by the clansman among his children, grandchildren, and so on; but a high military spirit was unfortunately combined with a profound contempt for labour. The castle of the chief was a kind of palace, to which every man of his name was welcome, and whither all usually flocked in times or local war. The inherent power of the chief, even Dr Johnson admits, was strengthened by the kindness of consanguinity and reverence of patriarchal authority. "The laird was the father of the clan," he adds, "his tenants commonly bore his name, and to the principles or original command was added, for many ages, an exclusive right of legal jurisdiction. This multifarious and extensive obligation operated with a force scarcely credible; every duty, moral and political, was absorbed in affection for, and adherence to the chief." Next to the love of him, was that of the particular branch from which they sprang, and the law or Kincogish, by which a chief was personally responsible to every member of his clan, was a truly Celtic institution. The idea of reciprocal affection and reaction was fostered with pride, and, under this idea, the warlike onset of the Highlanders as stimulated by resentment and cemented by sympathy from blood, was as impetuous as a mountain torrent. Even after the commencement of the present century, in the ranks of our Highland regiments the clansmen followed with alacrity their chief, or the sons of their chief, to many a hard-fought field, and we can remember to have heard many an old Highland officer speak with pride and affection of "my father's men," or "our people." With all its defects and peculiarities, clanship, which gave men a claim upon each other, as of common kindred was a singular and noble institution. "Blessed be that spirit of nationality or clanship," says Andrew Picker (in his now forgotten romance, "The Black Watch"), "or by whatever name the principle may be called, which opens the heart of man to his brother man, and, in spite of the trained selfishness to which he is educated in artificial life, bids the warm and glorious feeling of sympathy gush forth in circumstances of sorrow and of trouble, to cheer the drooping heart of the unfortunate, and prevent his swearing hatred to his own species." The right of chieftainship was vested in the males alone, and times there were, when a brother was deemed better for the part than a son, as in the case of John of Moidart, when his nephew, Ronald Galda, proposed to have a feudal charter for the land of the tribe. "When a chief," says Logan, in his "Gael," "entered on his government, he was placed on the summit of a pyramidal cairn, with his people around him. A sword and a white wand were delivered to him, and the bard or Druid recounted his pedigree and the exploits of his ancestors, exhorting him to emulate their example. The ancient chiefs had hereditary standard-bearers, an honour to which perquisites were attached, and, under Sir Donald MacDonald of Slate, one enjoyed these in the 18th century. The Clan-na-Faiter held lands in Bracadale for preserving the Brattichshi or banner of MacLeod. The henchman, who remained ever close to him, and stood behind him at table; his bladair or spokesman; the bard; the piper and the piper's gillie; the gillie-mhor, who bore his broadsword; the gilli-cosfluich, who carried him through rivers; a gillie who led his horse in dangerous places; a baggage gillie, and a gillie-nuithe or running footman. In battle he had his Leine-chrios (i.e. shirt of mail) or chosen bodyguard, who fought around him. The Highland force in the field for King James in 1715, as given by General Wade, was 14,140 men. The actual force which fought at Culloden was only 3850, as 3000 were absent, and the MacDonald brigade did not charge. The actual fighting force of the Highlands at this period (irrespective of many small tribes) was estimated, by the Lord President Forbes, at 31,930 men. Had all followed Prince Charles, we should never have heard of his retreat from Derby. After the battle of Culloden, Government became sensible of the danger attendant on the high authority possessed by the Highland chiefs. Their followers were no longer permitted to wear arms, or even their native dress, and a regular administration of justice was substituted for the patriarchal mode of repressing crimes and redressing grievances. Their safety no longer required a numerous body of men, but clanship for a time prevented any material change in old habits and thought; but, as the ancient proprietors wore out, their successors began to be tempted, by increase of rent to transfer their farms to new tenants, who brought with them a more improved system of agriculture; and, from that time the double tide of emigration and wholesale expatriation set steadily in, and great injustice and cruelty followed. "Under the old Celtic tenures," says Sismondi, "the whole of Sutherland belonged to the men of Sutherland. A count or earl had no more right to expel from their homes the inhabitants than a king to expel from their homes the inhabitants of his kingdom." "Instead of the land belonging nominally to the head," says John Hill Burton, "it belonged - so far as there really was any property in it - to the holders and cultivators of it, while their chief or head had concern, not with it, but with them as living beings, even absolute rule." "It is difficult to deny that a MacDonald, a MacLeod, a MacKenzie, a MacKay, or a Cameron, who gave a son to his landlord, eighty years ago, to fill up the ranks of a Highland regiment, did morally acquire a tenure in his holding, more sacred than the stipulations of a written covenant. Few will affirm that the descendant, in possession, of such a man should, even now, be regarded by the hereditary landlord in the same light as a labourer living in a Lowland village." One of the most distinguishing features of the Gael of Alban is their highly picturesque costume, which, for ages unknown, has been peculiar to themselves alone. A fragment of sculpture dug from the ruins of Antonine’s wall (built A.D. 140) "and now" says Logan, in 1831, "preserved at Croy, represents three figures, which are doubtless meant for Caledonians, whose dress is in strict resemblance to the national garb, and is similar to that of the ancient Celts. Gildas," he adds, "describes the Scots and Picts of his time as having only a piece of cloth tied round the loins; and on the remarkable obelisk at Forres in Morayshire the Scots are represented in tunics fastened round the waist-precisely the little kilt of modern times, as worn separate from the shoulder plaid or feile-mhor." Herodian, who flourished A.D. 247, in describing the dress of the Caledonians, states that they were only partially clothed; and Grant, in his "Origin of the Gael", gives a passage from Diodorus Siculus, stating that the natives of Gaul, from whence, no doubt, the Gael of Alban came, wore a sort of tartan, or clothing of various colours; "thus," says Robertson, "it is no idle boast when we call it ‘the Garb of old Gaul.’"
The kilt, as worn at present, apart from the plaid, is simply the re-adoption of a still older fashion, which is to be found depicted on many of the mediæval crosses and memorial slabs in the West Highlands, in the churchyard of Kilkerran, on two crosses older than 1500, on the cross of MacMillan in Kilmorie, and elsewhere. On these the kilt alone is shown, neatly plaited to the knee, thus proving that the great belted plaid of the 16th and 17th centuries was the combined and more modern garment of the two ("Proceedings, Antiq. Soc. Scot.," 1872). This the Highlanders were wont to let slip in battle, charging in their saffron shirts alone; hence it is that Famiano Strada, in his "Belgic Wars," when describing the battle of Mechlin in 1578, says, "Here the Scots fought naked." "Scoti nudi pugnantis in prælio Mechlinensi" are his words. The Iceland Sagas contain some of the earliest allusions to the distinctive character of the Highland dress; and they relate how Magnus Olafson, King of Norway, and his followers, when they returned from ravaging the west of Scotland "went about bare-legged, having short kirtles and upper wraps, and so men called him bare legs." This was in 1093. The antiquity of tartan, or something resembling it, is undoubted. Diodorus Siculus, describing the Gauls says they wore tunics, dyed with all manner of colours, as we have said, and close trowsers, which they called bracœ. Now breac, in Gaelic means anything speckled or striped to this day. The termination an thus makes a compound word, and breachin, may therefore signify narrow stripes or small chequers. Heron, in his "History of Scotland," says that in Argyll and the Hebrides before the middle of the 15th century, tartan was woven of one or two colours for the poor, but of more varied colours for the rich. Halve ane elne of duble tartane, to line collars for her lady, the Queen - £0 8 0"
Martin tells us that the different isles in the west had different patterns of tartan. The Highlanders had neither cochineal, foreign woods, nor the many brilliant hues we can produce now, to tint their breacan, but their native hills afforded articles with which they found the art of dyeing permanent and pleasing colours. Every housewife was competent to dye red, blue, green, yellow, black, and brown, with their various compounds. "The particular setts or patterns, appropriate to each clan, must have been long fixed," says Logan, "and breacan was a kind of coat armour, by which a man’s name and clan were at once recognised." Elsewhere he says, "The advantage of the plaid is incalculable. During rain it could be brought over the head or shoulders, and, while other troops suffered from want of shelter, the Highlander carried in his mantle an ample quantity of warm clothing. If three men slept together, they could spread three folds of warm clothing under and six above them. The 42nd, 78th, and 79th regiments, which marched through Holland in 1794, when the cold was so severe as to freeze brandy in bottles, suffered incomparably less than other corps, who wore plenty of warm apparel." On the ancient cross at Dupplin the kilted figures are furnished with round targets, and a sculptured stone at Nigg, thought to be not later than the 7th century, represented a kilted Highlander with a sporan or purse. According to Dr Armstrong, the belted plaid was the full dress; the feile-beg or present kilt was the undress. Originally the Highlanders, for the most part, went barefooted or wore cuarans, at first of untanned leather, latterly they were neatly ornamented. The hose were the same pattern as the kilt, and cut out of the web. The accounts of the Lord High Treasurer, in 1583, contain the full details of a Highland dress for James V., prior to hunting in the north. In 1616, Taylor, in his "Pennyless Pilgrimage," describes the kilt and hose of the Highlanders as "warm stuff of divers colours, which they call tartan," and adds that they wore flat blue caps, and that their arms were long bows with forked arrows, swords and targets, muskets, dirks, and Lochaber axes. In the use of the bow the Highland archers surpassed the Lowland generally, and of that ancient weapon Montrose, in his wars, was fain to avail himself. The bow of the clansman was long, and, as his food in peace and his life in war depended on the surety of his shaft, it was framed with unusual care. The bows of Glenure wood were deemed superior to all others. The wood of the shafts was from Esragoin in Lorn; the feathers, from the swift eagles of Lochtreig; the wax for the strings was furnished by Baill-na-gail-bhinn; the arrow-heads, by smiths of the race of MacPheidearin; and thus accoutred, it was superstitiously thought that a son of the Gael could never miss the heart of an enemy. In addition to his claymore, the Highlander had an arm-pit dagger, a target with a pike in its orb, a long-barrelled Spanish musket, and a skein in his right garter, the last weapon to resort to if under a horse’s belly. Our best example of the Highland fighting dress, during the 17th century, will be found in the description of the coat armour, granted to Cluny MacPherson in 1672, having for supporters, "two Highlanders, in short tartan jackets and hose, with helmets on their heads, dirks at their side, targets on their exterior arm, their thighs bare, and shirts tied between them." "They wore sleeves of scarlet cloth, closed at the ends as men’s vests, with gold lace round them, having plate buttons set with fine stones. The head-dress was a fine kerchief of linen, straight about the head. The plaid was tied before on the breast, with a buckle of silver or brass, according to the quality of the person. I have seen some of the former of 100 merks’ value, the whole curiously engraved with various animals. There was a lesser buckle which was worn in the middle of the larger. It had in the centre a large piece of crystal, or some finer stone, of a lesser size." The plaid, which, with the exception of a few stripes red, black, or blue, was white, reached from the neck almost to the feet; it was plaited and secured at the waist by a leather girdle, studded with silver. The Odom Library is contributing material from its growing genealogical archive, for publication in ATAVUS. Each issue the journal will feature extracts from the collection, giving readers a taste of Scottish literature of old. Read Chapter One in this series on Clanship and Chiefs Dress and Arms. The Odom Library is located at 204 Fifth Street, S.E., Moultrie, GA 31768; telephone (229) 985-6540. The wing is open during regular hours of the Moultrie/Colquitt County Library, Monday through Saturday, 8:30 a.m. to 5:30 p.m., and Tuesday 8:30 a.m. to 8:00 p.m.
Search for Scottish Clans on our Clan Map of Scotland.